Pedalling Squares: Put not your trust in Euskaltel riders. In 2003 Iban Mayo tore up Alpe D’Huez so fast on his way to a stage win and eventual sixth place overall that in the space of the 39 minutes and six seconds it took him to climb the alp he became the repository for all of Europe’s cycling hopes and, more importantly, all of mine. At that time, all the riders who seemed capable of defeating Lance Armstrong were either busy having nose jobs, enjoying a heady cocktail of black forest gateaux, muesli and amphetamines or were riders yet to fully mature and sadly destined to smash themselves to bits or dope their pets rather than put up a fight. Consequently, Iban Mayo became our totem, our hope for ending the reign of that glowering, graceless Texan. And what did he do? He retired halfway through his next two Tours, suffered from 'the kissing disease', and eventually tested positive for EPO. What does this waffle have to do with today’s Vuelta, I hear you ask? Technically nothing, but I am a blogger, and therefore have staked my paper-thin self-esteem on the idea that my wandering thoughts can be just as relevant as the cold hard facts supplied by proper journalists. 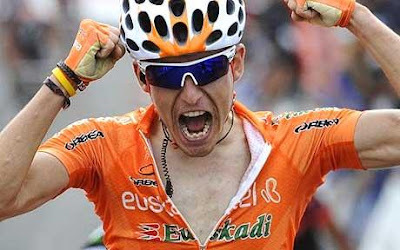 My feeling in this case is that Euskaltel have let me down again. After Mayo I went cold on the orange clad squad, who’d been a loose favourite of mine ever since the days when lowly second division teams like Benfica (the cycling team not the football club), Brescialat and the like were profiled in the pages of Cycle Sport magazine. After Mayo, I could never warm to the flaming carrots, and barely noticed the Olympic win and Tour performances of Sammy Sanchez. Then along came Igor Anton. He looked strong in the 2010 Vuelta, winning two stages and having a forty odd second advantage in the red jersey until he was knocked down like fire damaged Nikes in a Croydon sports shop by a bit of two-by-four in the road. He came good again earlier this year at the Giro d’Italia, winning on the Mt Zoncolan, one of the most sadistic climbs in cycling. Given that he then began resting and preparing for the 2011 Vuelta, which also contains a fairly sadistic climb in the form of the Alto del Angliru, things looked good for him, and I embraced the Euskaltel boys once again and picked Anton to win the Vuelta. Perhaps I’m just a jinx? He looked a little iffy on yesterday’s climbs, but I thought nothing of it. I assumed that their lack of importance in the overall scheme of things meant he probably wasn’t giving them his best. Today, however, you couldn’t kid yourself. The early climbs were clearly as tough as yesterday’s as was obvious from Stijn Devolder’s wobbling and weaving that had me momentarily convinced I was watching the previous stage’s highlights. But Devolder is a squad rider for whom lightning has struck twice. Surely the serious climbers like Anton would be ok? Then came Sierra Nevada. Not that steep, but really, really long. And there’s Igor Anton, sitting at the back of the bunch. Still at the back. Still. Those little gaps between riders that open and close naturally on the corners? They’re not closing naturally for Anton. He’s clawing them closed. He might as well be sinking his fingernails into the tarmac and scrabbling up the hill without the bike. Eventually he dropped off entirely which was a shame, but not half as bad as what happened next. Three teammates came back to pace him up the rest of the climb, and for some time the foursome were seen working as a slow moving unit, occasionally wafting past the odd lone rider falling from the pack, but before long it became embarrassingly apparent that Anton couldn’t keep up with his teammates either, and they returned to the pack, leaving Igor to labour on alone, eventually coming in 1:38 down on the bunch and 2:44 down on the new red jersey, Sylvain Chavanel. More importantly, he’s 1:51 down on race favourite Vincenzo Nibali. Of course he’s got three flat days to recover before the next mountains. There’s even the chance he might be riding himself into form for the nastier climbs ahead, but these aren’t the bad old days when massive deficits could be overturned by pulling a few ‘cold ones’ from the fridge. You’d have to say Anton’s chances for the overall are gone. When it comes to humiliating days in the mountains I’m reminded of poor Ivan Basso’s long and televised diarrhoea attack in the snowy Gavia pass in 2005, where he lost over forty minutes and the Maglia Rosa. He did at least manage to secure a face-saving stage win a few days later, and that’s now what I’m hoping Anton will do. In the parts of the race that still mattered both Vincenzo Nibali and Bradley Wiggins looked extremely comfortable, almost nonchalant, as they occupied the vital spots at the front of the group and led up the Sierra Nevada. While attacks from Chris Anker Sorenson and Daniel Moreno were able to sweep past the breakaway remnants, they never managed to get their gap beyond 14 seconds. That Moreno was far and away the quicker man was obvious from the start, and it must have been all he could manage not to start his victory celebrations around 3K out when it became obvious that Sorenson couldn’t grind him off his back wheel. Finally, there’s Cav. I’ve always thought that three Grand Tours in a year is a big ask even if you are only hunting stage wins. Add to that the temperature of nearly 34 degrees in the shade and it’s no wonder Cav climbed off. Given that he was sharing a room with Matt Goss, who retired with stomach troubles yesterday, no one would be particularly surprised if it turns out that the Manx Missile has got a touch of Basso Belly. The question now is, how does he prepare for the Worlds? The GP Ouest France is one possibility, as is the Tour of Britain, but having been booked onto La Vuelta, he’ll need to ask the organiser’s permission to start a different race for fear of a fine and fifteen day ban. This is widely considered nothing more than a polite formality, so we should see Cavendish in action somewhere cooler and flatter before too long.